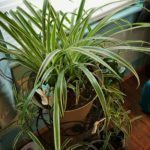 Caring for spider plants is easy. These tough plants tolerate lots of abuse, making them excellent candidates for newbie gardeners or those without a green thumb. Provide them with well-drained soil and bright, indirect light and they will flourish. Water them well but do not allow the plants to become too soggy, which can lead to root rot. In fact, spider plants prefer to dry out some between waterings. When caring for spider plants, also take into account that they enjoy cooler temperatures — around 55 to 65 F. (13-18 C.). Spider plants can also benefit from occasional pruning, cutting them back to the base. Since spider plants prefer a semi-potbound environment, repot them only when their large, fleshy roots are highly visible and watering is difficult. Spider plants can be easily propagated as well through division of the mother plant or by planting the small spiderettes. As daylight increases in spring, spider plants should begin producing flowers, eventually developing into babies, or spider plant spiderettes. This may not always occur, however, as only mature plants with enough stored energy will produce spiderettes. Spiderettes can be rooted in water or soil, but will generally yield more favorable results and a stronger root system when planted in soil. Ideally, the best method for rooting spider plant spiderettes is by allowing the plantlet to remain attached to the mother plant. Choose a spiderette and place it in a pot of soil near the mother plant. Keep this well watered and once it roots, you can cut it from the mother plant. Alternatively, you can cut off one of the plantlets, place it in a pot of soil, and water generously. Place the pot in a ventilated plastic bag and put this in a bright location. Once the spiderette is well rooted, remove from the bag and grow as usual. If you begin to notice spider plant leaves browning, there’s no need for worry. Browning of leaf tips is quite normal and will not harm the plant. This is often the result of fluoride found in water, which causes salt buildup in the soil. It usually helps to periodically leach plants by giving them a thorough watering to flush out excess salts. Be sure to allow the water to drain out and repeat as needed. It may also help to use distilled water or even rainwater on plants instead of that from the kitchen or outside spigot.